We first read The Littles Take a Trip back in February (title linked to my review) and really enjoyed the story about these tiny people. Since that reading, we have collected several additional titles in the Littles series, by John Peterson. 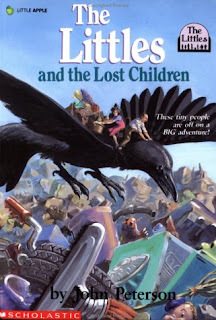 Recently we read The Littles and the Lost Children . This particular title is book 12 in the series, and we had clearly lost some family developments by skipping ahead but it wasn't so distracting or diverting that we weren't able to dive into this book. After having read book 12, I would say that they do not necessarily have to be read in order, although I would recommend reading The Littles or The Littles Take a Trip first so as to become familiar with the main family. In The Littles and the Lost Children we are introduced to the Small-Fry family who live at the top of Smoke Mountain. The Small-Frys are makers of fabrics and they decided to take their wares to the Trash Tinies to see about doing business with those little people. The Small-Frys are warned against going to try to find the Trash Tinies. You see, the Trash Tinies are well-hidden underneath the town garbage dump and it is dangerous and difficult to try to find their city. As a result of them being difficult people to find, other tiny communities aren't sure whether or not the Trash Tinies are kind or vicious. This does not deter Mr. and Mrs. Small-Fry who think themselves up for the adventure. Eventually, parents and children are reunited. The story is rather unbelievable and can play on emotions. Lost children, adoption, separation and reunion are all themes in this book. None of these things bothered Bookworm1 but I should point them out all the same. We still enjoy The Littles and were happy reading about this little adventure. We have plenty more stories to choose from and I let Bookworm1 select the titles he is most interested in. Not sure which we will get to next but we both recommend The Littles as a great read-aloud! To see what other people are reading aloud with their kids, visit Hope is in the Word. I'm pretty sure I have The Littles in my box of books from my teaching days...I'm not sure if we have the patience for it...but in a few more months, I think we will! This is a wonderful series of books!!! It's nice to see that someone is still reading them. Thanks for the review! Anyway, thanks for reminding me about the Littles. I remember enjoying these stories when I was younger. I'd like to introduce them to my girls.